This touched me because my beloved husband of 61 years is 91 and in major failing health ... I wish he never had to endure the indignities of extreme old age! I'm so sorry dear Jill. Thank you for telling me. I'll be thinking of you. Please do keep in touch. This is lovely and so poignant. Extreme old age, as Jill says above, is tough to endure. My Dad, if he were still here, would be 93, almost 94. I miss him and my Mom every day. I'm hoping for healthy extreme old age! Too greedy of me?! I'm sure you do miss them both. Such love between you three. 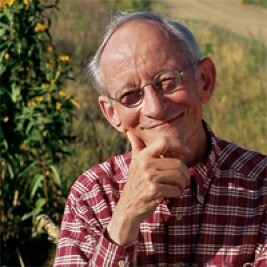 Good old, Ted Kooser! His words are so honest and real. This poem really speaks to me. My dad will be 86 in January and while I hope he's around for many more years, I hope he doesn't have to endure the indignities of extreme old age. I agree. And I do know that it is meaningful to you. My in-laws are both in 92 and they live at home together but with no help. This last month my father-in-law wrecked bother cars and lost his drivers license. My mother-in-law is the caretake for my step father-in-law who is a stubborn man and will not move out of their house or get help. It is hard ot be old for those who are and those who love them. Very frightening about the car accidents. And so hard for each of them, in their own ways. It is awfully hard to be independent all one's life, and then to have to ask for help. First time I've heard expressed the feeling of relief the loved one has died while at the same time missing them very much and understanding them better over time. That's a gift of poetry, I think. It can express the inexpressible. Thank you, Nan. This is really touching my heart. Poetry is so special. It can say things that we often only feel. Wonderful, wonderful about Scrabble!! What we all hope for! Yes, we now have Shetlands. Smaller sheep than our past Rambouillets, Border Leicesters, Romney crosses. Tom said he couldn't bury any more big sheep! How are all your animals? I miss your postings.